We had good success growing vegetables of the cucurbit family (pumpkin, zucchini, squash) last year with the Waterboxx without any watering after planting. We decided we wanted to repeat our success this next year but with more compact and vertical growing platform, a three tiered raised garden bed, or something we call a Waterboxx Planting (Half) Pyramid. 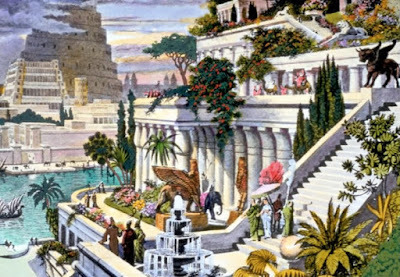 This idea was sparked by stories of one of the ancient wonders of the world, the Hanging Gardens of Babylon - a terraced garden that allowed lush foliage in the desert. First, we purchased the lumber. 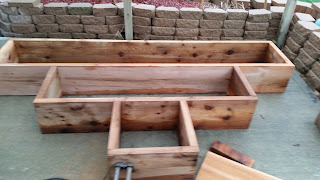 We wanted this box to last indefinitely, and as treated lumber is toxic and cannot be used for raised garden beds, we got cedar for its resistance to decay. 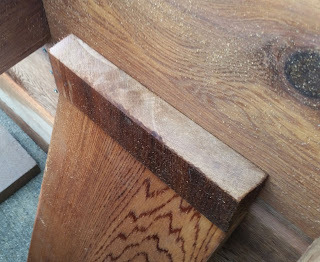 Cedar is a very expensive wood but we expect it to last more than a decade. Other wood can be used (including standard untreated lumber), if you are not planning on using the box for more than about 5 years. There is a product available called Soy Seal which some gardeners use for raised garden beds (we have not), which is purportedly non-toxic. Soy Seal will likely extend the lifetime of your wood by at least a few years. 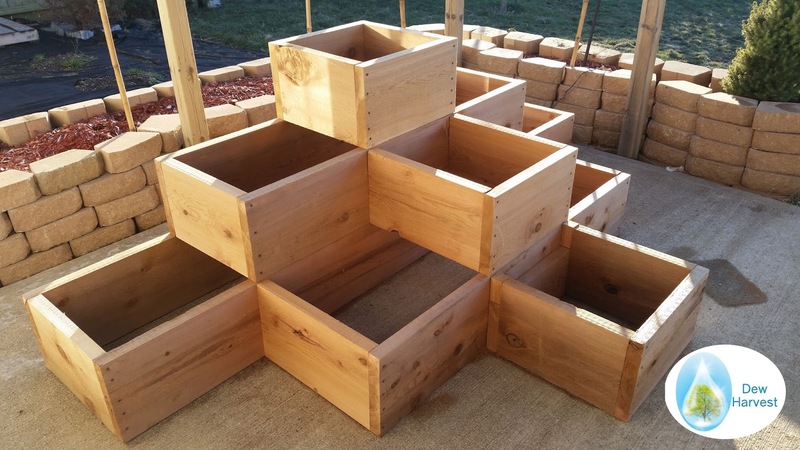 We planned to build a box with 9 spots for Waterboxx grown plants, or a total of 9-27 Waterboxx plants (depending on what is grown). The Waterboxx is 16 inches wide at the base and 19 inches wide at the top, so each space needed to accommodate this size. 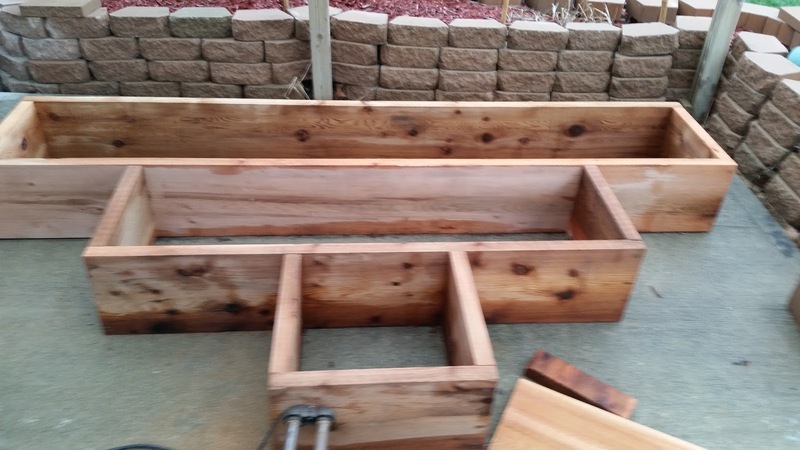 We purchased 6 quantity 2 inch wide by 10 foot long pieces of cedar wood. These pieces can be 6, 8, 10, or 12 inches in height. We also purchased a large box of coated 3 inch deck screws. Our starting materials - 6 quantity 2x12 inch x 10 foot cedar boards. You will also need gloves, a measuring tape, a right angle/triangle, a marking pencil, as well as a circular saw (not shown). Note, there is a PDF file on our main website with a chart with all the cuts needed for the planting pyramid. It may be easier to view it there rather than seeing the cuts written out. First, we used two of the 2 x 12 inch x 10 foot pieces of cedar to make the back base. 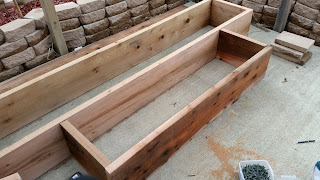 It should be noted, that if you just want to create a simple patio raised bed that will fit up to 5 Waterboxxes, this design will suffice. We measured 103.25 inches from the end of both of these pieces. We then measured (to confirm) 16.75 inches from the other end - we made sure these two measurements agreed. We used a straight edge to mark this line, and cut both pieces to 103.25 inches. We then put the 16.75 inch pieces in between the two 103.25 inch pieces, and secured them with three coated deck screws from each end side, for a total of 12 screws. More screws can be used if desired. We were careful to make sure the box was on a flat surface and as close to level and perpendicular as possible. 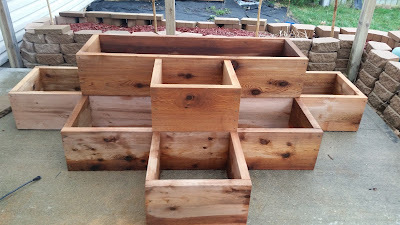 The bottom-back section of the raised bed garden box. This section can be used alone for up to 5 Waterboxxes and potentially for 10-15 garden plants, all without any watering. Next we needed to measure pieces for the middle base section. (Note: there is also a PDF file with an overall blueprint on the main Dew Harvest website here). 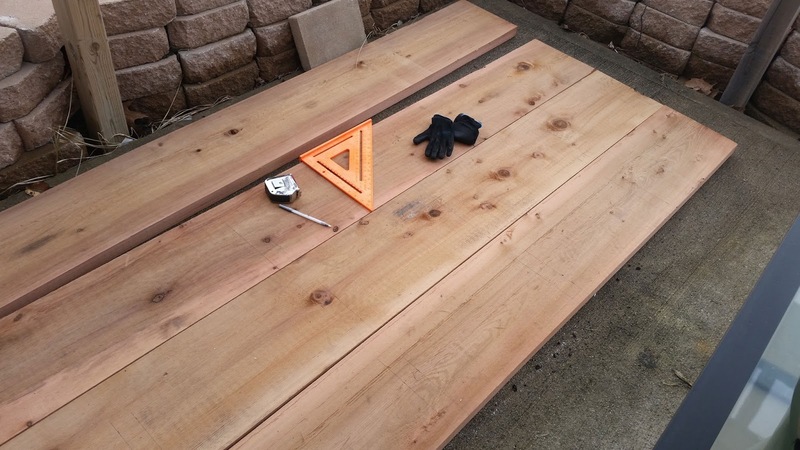 Take a third cedar board and measure off a length of 62.25 inches. Cut once after measuring 3 times (cedar is expensive) and put the remainder off to the side for later. With another full length board, measure off 20 inches 6 times (so six equal boards of 20 inches). Measure three times, cut once. 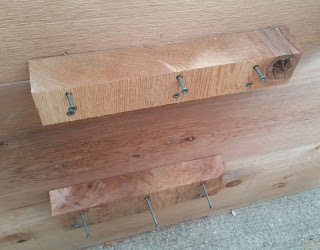 Place the 62.25 inch board in front and two 20 inch boards behind and connect with deck screws. The easiest way to do this is to make a "bench" that is 62.25 inches long with two "legs" that are 20 inches tall (inside length). Make sure the inside corners of this are square (at 90 degree angles) before fastening. Measure 20.375 (20 and 3/8) inches in from the ends of the long (103.25 inch) back piece and mark this. Place one 20 inch piece of wood perpendicular to the 103.25 inch piece (front of the original 9 foot box), just inside the 20 inch mark from the edge. The other 20 inch piece (the other "leg" of the bench, now turned on its side), should be lined up just inside the other 20.375 inch marking. Working from the side of your largest rectangle, drill 5 holes into the 20 inch "legs", through the 103.25 inch pieces. This forms the middle section of the base of your half pyramid. Next, mark 21 inches in from either end of the now front portion of the pyramid. Cut a 20.25 inch piece (see our blueprints here) for a "seat" and attach two 20 inch "legs" to it, making a bench as described above. Next, attach the bottoms of the two "legs" to the 62.25 inch board in the same fashion as done before. The first or bottom level is now complete. The middle tier consists of two rectangles, and is similar, but not identical to, the front 2/3 of the base. Take one of the remaining 62.25 inch boards (if it has already been cut by using our blueprints). Attach 16.5 inch boards inside of the ends of this - using the bench method described above. Remember - always use the longer board on the outside. Next, flip the "bench" upside down and add the final 62.25 inch board to the bottom of the 16.5 inch bench "legs". This will make a rectangle that is 62.25 inches long and about 20.5 inches wide. Lay this rectangle flat so all four sides are touching your flat working surface. 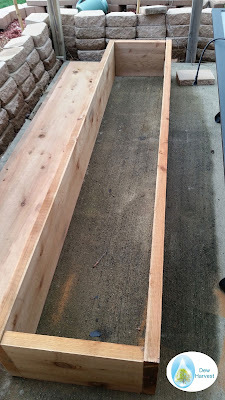 Next, get another 20.25 inch board, and attach two 20 inch board "legs" to it, using the bench method (the 20.25 inch board should be on the outside or the "seat" of the bench"). Attach this to the center of the 62.5 inch box you just made. You can then place these two rectangles (and the middle level) on top of your first tier of the pyramid - but do not attach it yet. Making the top level of the pyramid is the easiest step. Of the remaining purposely cut pieces (not the scraps) - you should have two 20.25 inch boards and two 16.5 inch boards. Assemble them in a square, using the bench method to start, with the 16.5 inch pieces on the inside of the 20.25 inch pieces. Make sure the corners are perpendicular, using the carpenter's square. This is the top level, and can be placed (but not yet secured) onto the back center of the second level. To prepare a site for the planting pyramid, find an area that is level but also gets sunlight during as much of the day as possible. You will likely want to tamp down the earth here - make this area level first (check with a bubble level). You can put the the planting pyramid on a cement patio (if that is all that is available) but be sure to attach weed cloth tightly to the bottom to prevent soil escaping (as discussed below). You will want to move the Waterboxx Planting (half) Pyramid to its final location, but before you do, we would suggest putting weed cloth fabric (not plastic) at the base of the pyramid. Weed cloth is porous to water but not generally penetrated by roots. This can be secured with tacks or staples. If you are placing the pyramid on weed free dirt, this is not absolutely necessary. If you are placing the pyramid on cement, we would recommend two layers of weed cloth secured tightly to the bottom of the pyramid base. This will allow the water to drain but will (generally) keep the soil inside the pyramid. You may have some dirty water running off the pyramid depending on your natural rainfall amounts. Make sure your final pyramid location is as level as possible. Move over each of the three tiers, bottom first, than middle, than top to their final location (ask someone to help with this - it is not a one person job). Stack them and line them up correctly so that each successive layer is in the middle of the one beneath it. Get out your level to see if the pyramid is level with the ground - if it is not, try to correct this by adding soil beneath the lower portions. You are now ready to connect the levels of the pyramid. To make the pyramid as aesthetically pleasing as possible, we will use connections inside the pyramid which will be hidden by soil. Find your two left over 4 inch scraps from cutting boards 3 and 4. Hold the connecting boards scraps in place using cement blocks. These pieces will have three screws attaching them to both a lower and upper level, or six screws total. When in place, there should be about half of their width touching both the upper and lower level. 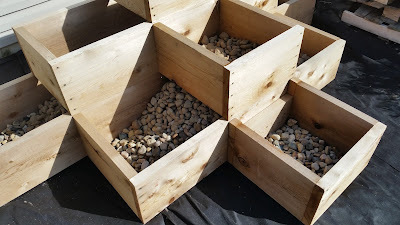 To keep them in place, you can have another person hold them while you drill pilot holes, or prop them up yourself with cement blocks or other wood scraps as shown. You can also hold the connectors in place with wood scraps as shown here. 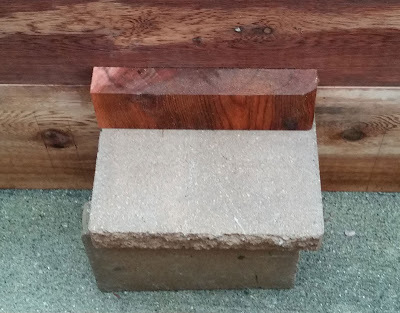 Use at least one connection between each tier - for better results cut up the remaining 17.25 inch board into 4 inch tall connection joints and use at least 2 connection joints per level - one along the back (inside the pyramid) and one along the front (inside the pyramid). These will keep dirt and water from escaping by minimizing space between levels. 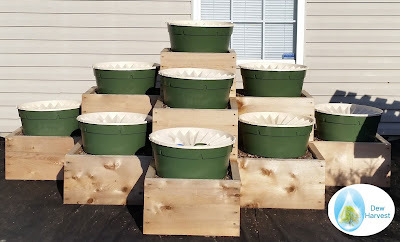 With your Waterboxx Planting Pyramid in place you can now fill it with soil. As potting soil and the other additives can be expensive, you can perhaps use some simple excavated garden soil for all but the top six inches of every level (i.e. -only the top eight inches of soil need to be of highest quality - just like topsoil in nature). If you live in a wetter climate and are concerned about drainage, you can use large stones and then small pebbles on the bottom of the pyramid, with only the top 8-10 inches being high quality soil. First, decide what soil mixture you would prefer for the top level of soil. We use Mel's Mix (from the book "All New Square Foot Gardening" by Mel Bartholomew) of 1/3 compost, 1/3 vermiculite, and 1/3 peat moss. If you don't have sufficient compost yet available, you can use high quality potting soil (we recommend MiracleGro purchased from a warehouse club like Sam's or CostCo). Fill the pyramid up to about 1 inch from the top at all levels. You can water the soil to compact it slightly if you would like. Next, either plant directly or transplant any garden plants you desire that you plan to grow with the Waterboxx. You can use the included white evaporation cover to choose spacing of plants. 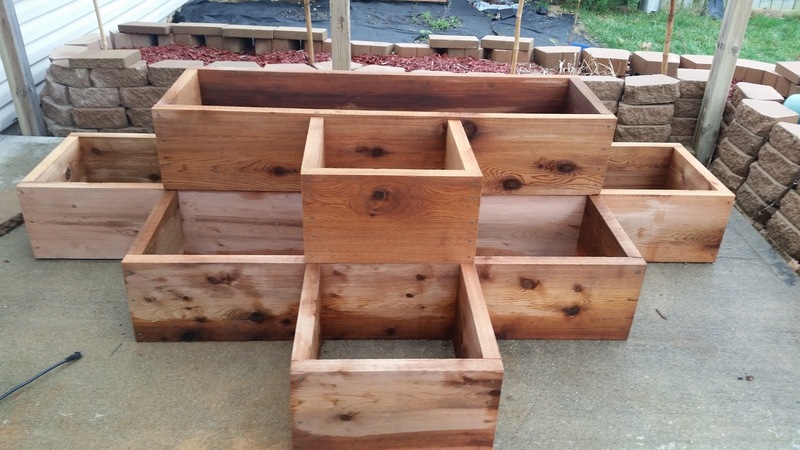 You will want to have the Waterboxx assembled when planting to make sure everything fits. 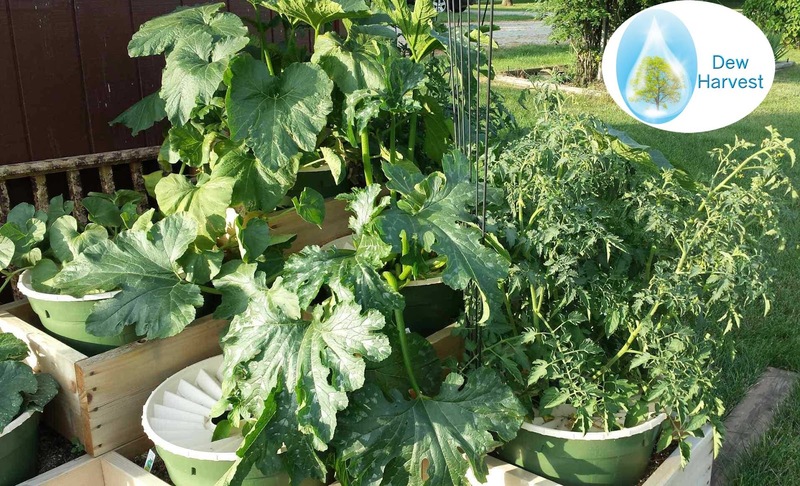 Once your plant reaches about 10 inches in height (or immediately after transplanting if the plant is already 10 inches tall), place the Waterboxx gently around the plant and add about 4 gallons of water to the Waterboxx. Do this with each planting space. If you would like to see the chart detailing the lengths of each wood cut, or the overall design blueprints, please visit our website page devoted to the planting pyramid here. A fully stocked planting pyramid - with zucchini, tomatoes, squash, and other plants - all without any water needed. If you would like like to know more about the Waterboxx or see results of using it, visit our main website, www.dewharvest.com.